Premium-quality micrograin solid carbide bit is precision ground for an extra-fine finish with maximum sharpness and edge retention. 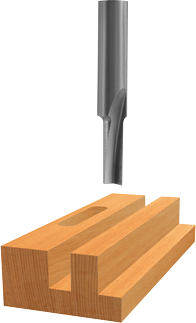 Single flute allows for faster feed rates in softer materials, while solid carbide gives best rigidity and long life. B. Cutting Edge Length 7/16"
85209MC 1/8" 7/16" 1/4" 2"
85208M 1/16" 3/16" 1/4" 1-1/2"
85212M 3/16" 7/16" 1/4" 2"
85215M 1/4" 3/4" 1/4" 2"